Disaster Risk Governance offers the first extensive engagement with disaster risk governance in the Caribbean and Sub-Saharan Africa. In the last decade and a half Kenya, Jamaica, Dominica, and Zanzibar have all suffered massive destruction from disasters caused by natural hazards. Despite the tremendous investments in disaster risk reduction (DRR), disasters have wiped out the developmental gains of these countries. 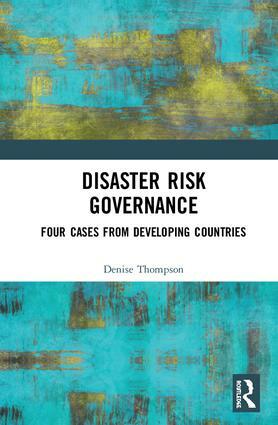 In this book, Denise Thompson argues that disaster risk governance (DRG) as a practical and academic matter has not been given the attention it deserves, and as a result, this neglect has undermined the time, money and resources invested in DRR in developing countries since the late 1970s and early 1980s. Thompson proposes that properly conceptualizing DRG based on context will help to address some of the deficiencies. Consequently, DRG needs to become a central focus, particularly for developing countries. Written with real-life implications for developing countries, Disaster Risk Governance, is perfectly suited for practitioners and researchers in area studies, disaster risk reduction and disaster governance, as well as students of disaster studies. In Risk Governance: Four Cases from Developing Countries Professor Thompson seeks to focus the radar on a seldom discussed and analyzed subject in Disaster Risk Management. Through the cases it explores another window for analyzing the relationship between the policies and politics of disaster risk management and the outcomes of hazard impacts. — Jeremy Colllymore, Honorary Research Fellow, Institute for Sustainable Development, University of the West Indies.